Go Getter Magazine India – are you looking for Go Getter Magazine Advertising Cost? Go–Getter is a on-board magazine for Go-Air. Advertise in Go Getter Inflight Go Air magazine and can ensure favorability, purchase consideration as well as awareness for your brand with Exopic Media. 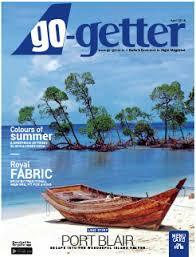 Cost of Advertising in Go Getter Inflight Magazine is depend on what kind of Ads do you want to publish. We At Exopic Media offers Best Go Getter Magazine Advertisement Rates for our valuable clients.